I was not going to talk about this because I didn’t think I had much to add. And I thought it was stupid. And, I’ve had run-ins with UFO Sightings Daily before (well, one). But, people keep talking about it, so it at least deserves a mention here. Everybody likes a good origin story. Wolverine made quite a lot of money. It would’ve been relegated to everything else of random bright spots in images except that the Houston Chronicle‘s reporter Carol Christian decided to write a story about it. And then two people posted to my podcast’s Facebook page (thanks Linda and Maryann). And Doubtful News picked it up, as did Phil Plait. It’s a cosmic ray. >99% chance. Here’s what happens: High-energy particles constantly stream throughout the universe. We’ve been detecting them for decades, and their energy varies considerably. Electronic imagers typically work when a photon – a bit of light – kicks up an electron within a pixel. Those electrons are counted after the exposure is done, and that’s how you get your image. When high-energy particles randomly stream into a detector, they are higher-energy than the photons we’re usually trying to collect, and they appear as bright streaks. Digital cameras that you use for normal photography have algorithms to remove those as known noise sources, so you typically never see them. We also see them more rarely on Earth because many are blocked by the atmosphere. Right now, some of my research is focusing on using images from the Cassini spacecraft in orbit of Saturn, studying some of Saturn’s moons. Here is one image of Rhea, taken by the ISS camera. It’s a raw image, about as original as you can get with respect to almost no processing has taken place. And look at all those stray bits of light! Pretty much every single one of them, including the two long streaks, and including the dots, are cosmic rays. But Wasn’t It Seen In a Second Image in the Same Spot a Day Later? Mike made this claim, and I saw it from a commenter on Phil’s blog. Thus far, no one has actually posted or linked to such a second image that I can find. If anyone has seen this claimed image, please let me know. And by “please let me know,” I mean providing the NASA image ID so I can find it. I know that Mike put an “Enhancement of April 3rd image” on his blog, but it’s useless for proving anything without the ID it came from. Maybe? This post might be slightly premature, and it’s a bit stream-of-consciousness, but I wanted to get it up before bed. The station on which I was listening to Mike on C2C decided to cut out the second half hour because of some crash somewhere, something about people dying, breaking news, etc. When I get the full audio, I may add to this, but it sounded like George was taking the interview in a separate direction after the bottom-of-the-hour break, though a caller may have brought it back up. 1. The object is seen in one camera, not in another, despite the two cameras taking an image at the same time of the same spot. 2. There is a claim that it showed up in another image a day later, but so far as I can tell, this is just a claim and no one has pointed to that image. If it exists, I’d like to see it and I’ll re-examine my curt analysis. 3. We see similar artifacts in other Mars images, and we see them all the time in space-based cameras, and we see them generally in all electronic cameras (at least those that don’t get rid of them for us). 4. The story comes from UFO Sightings Daily and only became mainstream because a reporter at a somewhat mainstream paper picked it up. So, what could it be? Aliens? Architecture that glints just right so it’s only in one camera of two that are right next to each other imaging something a few miles away? An impact flash from a crater forming? 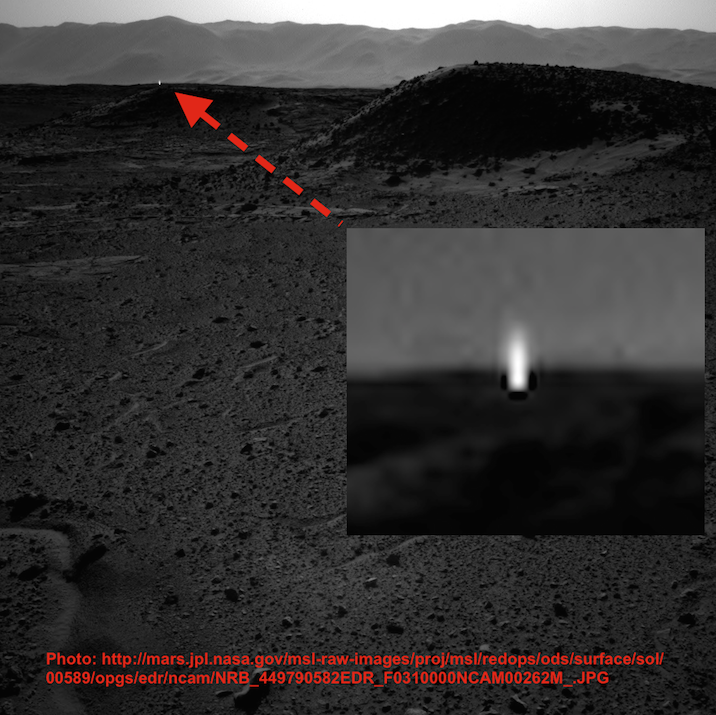 A dust devil reflecting the light just right? Lens flare? Or a cosmic ray? I don’t think any of those previous explanations are likely, I think this is most likely. Bara, as with other UFO / aliens protagonists, say that Curiosity should live up to its name and drive over there and investigate. Yup, take days, power, money (gotta pay the ground crew), and investigate what is very likely to be a high-energy particle that made it through the atmosphere and onto a camera’s CCD. Edited to Add (10 hrs later): Per Phil’s latest blog post: “Except not really. Another expert on Mars hardware said it may have actually been a “light leak”, a bit of sunlight that somehow got into the camera through a hole, or crack, or seam somewhere in the hardware. He also says it may be a sharp reflection of sunlight off a glinty rock. Those are certainly plausible, though right now we don’t have enough evidence to say for sure which of these explanations may or may not be the right one.” Yup, another possibility. 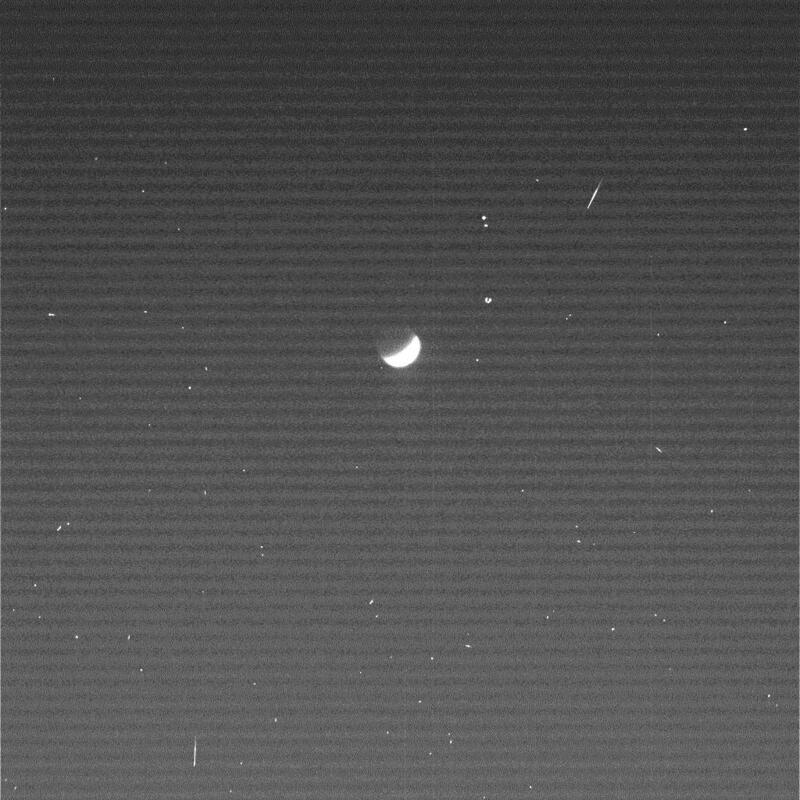 As is a defect in the camera sensor itself (see discussion in the comments to this blog post). I haven’t done one of these before, but I thought that since everybody’s doing it, of course I should, too. I’m not going to talk about overall stats or stuff like that except in specific cases. More, I’m going to talk about content on here and my podcast. I’ll start with this first to get it out of the way. This year saw me start by changing my podcast from two to four promised episodes per month, which I then had to drop down in September to two again. January should see me go back up to four. Topic-wise, I covered a vast variety, with Planet X and image processing, age modeling / dating and pyramid-star correlations (claimed). I also produced my first video, and while promising a second, I still have yet to deliver it. The year started out with my first actual blog post on scoring psychic predictions for 2011. I posted it January 5 and it failed to reach the page views I had hoped, despite Phil Plait tweeting about it mid-February. I’m working on getting 2012’s out much sooner (next few days … by Jan. 1). Anyone who has suggestions about places I can post/link/send my 2012 psychic predictions run-down to (I’ll be grading over 300 predictions by about 15 “pros”), let me know. I really didn’t have too many posts on this until “the end” – the last few days leading up to December 21, 2012. Obviously this was the major topic for “pseudoastronomy”-related topics this year, at least in terms of public consciousness. As such, it was by far the most common search term that got people to the blog, and my page views rose steadily in the weeks up to 12/21/2012. They then doubled in the two days before and on that date, and now dropped down to about 10-15% that level. I’ve been approached by the admin of the 2012hoax.org website to get involved with his next project — I’ve agreed as my time allows, so you may hear more on that later. I wrote a post about this but never actually posted it. I’m still not going to mention specifics because I don’t see a huge need to at the moment, but I can talk about it without using names nor subject matter. I may also screen comments that make specific allegations about it — just FYI on that — and I will not respond to requests for more specifics. I was (peripherally) threatened with a lawsuit in September over a series of posts I had written relating to what is considered by the vast majority of scientifically literate people to be a pseudoscience. The person in question said I had lied about them, that I had made false allegations about them, and that I seemed fixated on them and it made them uncomfortable (despite having written one blog post referencing their material in the 2012 calendar year). And there were many others in this person’s field-of-choice whom I could pick on. I say that I was “peripherally” threatened with a lawsuit because I was never contacted directly by this person nor an agent acting on their behalf with regards to this matter. Rather, I found out about this when my boss e-mailed me telling me that this person had written to him about me and talking about suing me. And then I found out that this person had written to my university saying that they may try to sue the university, as well, because of what I had written. And then within about two days, it all disappeared. The posts on this person’s website about me were taken down, the person’s Twitter feed went private, and even the Cyber Security ad that this person or this person’s agent had posted went unfulfilled. My guess – and this is not a statement of fact, it is my own musing based on the evidence that I have – is that this person actually did contact a lawyer as they had threatened. And the lawyer told this person that not only did this person have zero case against me (not only because the case was without merit but also because of the statute of limitations on libel in the US), but now I would have a fairly good case against this person for libel, harassment, and employer (attempted) intimidation. I’ve maintained all my documentation about this, including what this person had posted, and perhaps at a later date I will post it (after the statute of limitations, perhaps?). Probably one of my more interesting topics – not for its actual subject matter, but more for what ensued as a result – was the whole shindig with Richard Hoagland’s claim of Mike Bara’s claim that there is a ziggurat on the far side of the Moon. A lot of stuff went into this, and that link provides an itemized and in-order contents of all the blog posts I wrote about it as well as three podcasts (including one video). It also resulted in Mike slamming me in his new book and going on at least a half-dozen radio programs and speaking out against my analysis. In the process, Mike continued to make numerous mistakes and conspiracy claims (such as he trusts no new images from NASA, or that he hasn’t trusted the Japanese (and so their lunar images) since Pearl Harbor). I’ve written and submitted an article for Skeptical Inquirer summarizing “what went down” and if it’s accepted, I’ll let y’all know. I’d consider this perhaps one of the more interesting things I did related to skepticism in 2012. In the past few years, some of my bread-and-butter was young-Earth creationist claims and going through them and showing why they’re wrong. This year, though I still have a dozen articles open that I plan to (eventually) write about, I definitely migrated to write more about other things. A larger theme this year was related to Richard C. Hoagland’s claims. Some have been just so crazy that I’m not sure I could even write about them. The fall into a category that I recently learned: Not even wrong. As in, it’s just so “out there” that there’s no place to even start to debunk it. It’s so wrong that saying it’s wrong is under-stating the wrongness of it. It’s off the charts on the Wrongitude® meter. Such as his phone-in to Coast to Coast AM on December 21, 2012, stating that HAARP was finally fulfilling its purpose and had been active all day, preventing the world from tipping over. I mean, how do you even start to address that? It was related to the lunar ziggurat stuff, but I don’t normally dip into many deep, personal feelings nor thoughts nor philosophy on this blog. I’m opinionated, definitely, but I don’t normally get into much detail. Probably the post that best exemplified philosophy this year was my post, “Do Skeptics Hate the People They Debunk?” I wish it had gotten more reads ’cause I considered it a pretty good post. Oh, and then I did a, “What’s a Skeptic?” post a month later. I also had a few posts this year on the basic scientific process. From grant reviews to how scientists are funded, to the fact that a presentation at a science conference doesn’t mean it’s not pseudoscience. This was also my first year at TAM. I wrote two blog posts about it, the first one on that page being quite lengthy and describing my experience, and the second one on that page being about errors in some of the talks. Looking back, 6 months later, I’d like to say that my views have mellowed somewhat, and that chances are >50% that I’ll go back in 2013. I’m also still attempting to convince D.J. Grothe to book me in some sort of speaking role (panel, workshop, maybe even talk? ), but as you can likely imagine, doing so can be difficult. I also started to write a few blog posts this year that I never finished … but will, as soon as I get unbusy. I swear ;). Obviously, as I’ve shown with my 2010 and 2011 psychic predictions, no one can predict the future. But, we can make some educated guesses. On the podcast front, I do plan on getting back to 4 per month. I may have to cut back again, but that’s the plan at least for the near future. I also want to get more into making some videos related to these topics. I have so many topics to write about in the queue that I’m not hurting for them, but finding time to do it will be interesting, at least for the first half of the year. I just heard back this morning from a large grant I had submitted that I thought had a very good chance of getting funded, but it did not. So, come July, I may have a heck of a lot more free time forced upon me. Anyone know the cheapest place to buy ramen? Conference-wise, I discussed TAM above. I will also be giving a reprise of my moon hoax talk at the Colorado School of Mines’ Yuri’s Night celebration in April, and I’ll be at the Denver Skeptics’ SkeptiCamp this May(?) giving some TBD talk — maybe about image processing gone wrong, maybe about UFOs. I’m also still trying to get on Coast to Coast AM. George Noory (the host) did state twice in the episode that Mike ranted about me that he would have me on. My last e-mail to George, about two months ago, did get a response, but it was very non-commital. Recently, I was fortunate and a recurring guest on the show who has followed some of my work suggested to Lisa (the executive producer) that I be on. So, we’ll see. I’m hesitant to nag, but if I go a year without mentioning it, chances are it’ll never happen. I will still post announcements for podcast episode releases to the blog. I realize for some people that may be annoying, but just stick the RSS feed in your reader and ignore those if you don’t want to read them. I’m not the best at marketing, but this is one outlet I can use. Edited to Add (12/27/2012): I’m also thinking I may finally try to do an eBook of some sort. Perhaps on Planet X and various peoples’ ideas for it and why NONE of them work. And with that all said, I think that about sums up 2012 for my Exposing PseudoAstronomy® franchise. To those who’ve made it this far, perhaps you’d like to Comment on what your favorite and/or least favorite topic(s) have been over the last year, and what you’d like to see different in the future. I’ll admit that when I initially thought up this episode a few months ago, I was going to talk about how you can’t do spectroscopy from a still photo of an alleged alien (as some have claimed to have done with Billy Meier’s stuff). But, given all the “goings ons” with the lunar ziggurat in the last week or two, this episode has turned into a Part 1 where this part discusses the very complicated but very basics of astronomy images and all the processing and calibrating that we go through to try to make it the truest representation of what we would really see. The main sections of the 41-minute-long main segment are: Black & White Astronomical Ground Photography, Different Spacecraft Camera Types, Releasing to the Community and to the Public, Color Processing, Quick Recap, Crazy Claims, How to Spot a Potential Fake or Forced Anomaly. Part 2 should (yes, should, not “will”) include things like dynamic range, curves and levels, interpolation, filters, sharpening, etc. More to-the-point about some recent “goings ons” on the blog. Hopefully a companion video will come out. Also in this episode was a New News segment, Q&A, and Puzzler. Given that it’s a 52-minute episode, I forewent Feedback. Do Skeptics Hate the People They Debunk? I recently produced my first podcast/blog-related movie, and it was debunking a claim that Richard C. Hoagland made on a radio show a few nights ago that there is a pyramid on the Moon. Working to finish the Eclipse Paper (which will blow everyone’s minds), so this “ziggurat herfuffle” comes as a bit of a distraction in the middle of that; however, it seemed appropriate to remind everyone — on the 43rd Apollo 11 Anniversary — how MUCH NASA has been hiding, all these years …. I find it fascinating the amount of vitriol my posting this simple image on “Coast” seems to have caused. “Hit a nerve,” perhaps ….? To be fair, I can only speak for myself 100%, but I can speak for several other skeptics (since I know many) indirectly, and I can speak for Expat, at whom most of Bara’s ire has been directed. We don’t “hate” purveyors of woo. Personally, I find interesting many of the claims because it makes me see where people who don’t really know what they’re doing go wrong in their analysis (yes, I realize this sounds condescending, but I’m working on a lack of sleep here — for a good example, see either my first post or my second post on Alex Tsakiris.). These people (unless they’re there with false platitudes) follow Mike and/or Richard almost like a cult leader, believing whatever they present uncritically and unquestioningly. A “Thanks for clearing it up Mike, well done!” was posted to Facebook in response to Mike’s blog. Meanwhile, I have seen no one actually point out any scientific nor logical flaws in my video (except for a brief mention of scattered light in shadowed regions, which I fixed in the updated version). Anyway, the question returns to, “Do I hate Mike and Richard and that’s why I made the video?” Again, no. I made the blog post because I had already spent 30 minutes in a scavenger hunt in the initial image. I made the video because I thought it would be a good “first” video for my podcast/blog because it was a purely visual argument, and I also wanted to capitalize on Phil Plait’s tweet regarding my post on Hoagland. Never have I said that I “hate” Richard nor Mike. I did state that in my opinion, based on my analysis, Hoagland was either incompetent in his image analysis or he was lying that he did any analysis on the image. That’s not the same thing. That is pointing out a flaw in a skill set (or lying about performing the task). That’s not hatred. Unfortunately, I doubt that Mike Bara’s tone will change; if he has never acknowledged he doesn’t know what an annular eclipse is nor how to measure an ellipse, then he’s not going to change his diction that gets his fans fired up. But, as with many of my posts, I’m attempting to speak to the “fence sitters,” those that really don’t come in with a dog on either side but want to know more about the situation. To them, I say: Examine the language used on both sides. See who has substance to what they say. Examine the claims made. Examine who is attacking the messenger, and who is attacking the claims. See if there is ever a rebuttal to the specific claims made on either side. Then decide who seems to be “hating” who, but more importantly, who makes a more convincing argument.